Rites of Battle: Team Up for Great Justice! Today I get to chat with you about one of my new favorite models supporting the armies of the ancestors, the young Tyrant Zaadesh. As our part of the cycle of lesser warlocks, Zaadesh brings a distinctly Skorne spin on the concept. He's impulsive young warlock, but he's also a man driven by his vision of the empire "as it should be." When Makeada overthrew Vinter Raelthorne, she adopted the mantle of Supreme Archdomina and was the first skorne to rule the whole of the people. Zaadesh wants to return the empire to its traditional ways of house warfare and infighting. For all that divisive backstory, he is a piece in your arsenal that can bind together a list and take the weight of running a beast heavy list off some of our fury-starved casters. If you're willing to take some risks, Zaadesh can be very rewarding, even if his beasts don't look like much on their own. 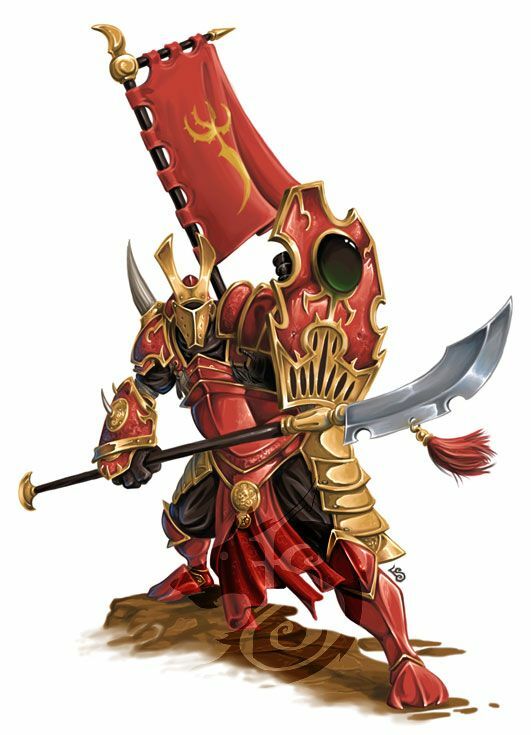 Zaadesh is a tyrant, a mid-level commander in his house's army, and thus has good but not elite MAT and the same defense and one more point of armor than a praetorean swordsman with five boxes. That's not much for a three point solo, but as a lesser warlock he has some of the same abilities as a full warlock: "Battlegroup Commander, Control Area, Damage Transference, Forcing, Fury Manipulation, Healing and Spellcaster." This means that he can control a battlegroup like your main warlock, but he doesn't have a feat and him dying doesn't cause you to lose the game. However, losing him will mean the beasts he controls go wild and your warlock will have to wrangle them to make them part of their battlegroup. One of the best defenses for a caster is having a high focus/fury stat, and thus a larger control area, so they can stay back farther. Zaadesh only has a FURY stat of four, so a control area radius of eight inches, lower than any of our full warlocks. Combined with his low armor and damage boxes, Zaadesh is going to require an effort to keep him protected. A bit of back story on Zaadesh before I get into his abilities. 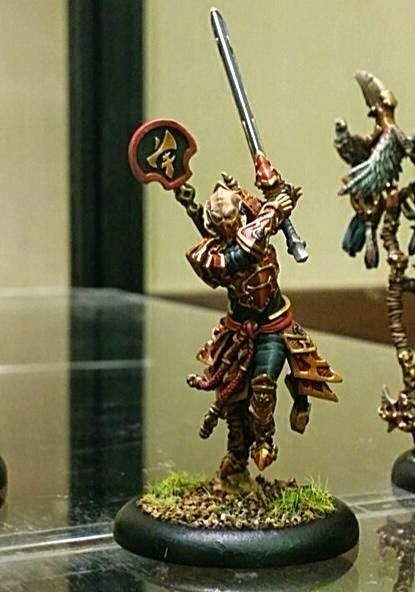 Paingivers in the skorne empire wear masks over the top of their faces to conceal their identities as they renounce all allegiance to their houses. Zaadesh wears a mask over the lower half of his face to a disfiguring wound he sustained when one of his first beasts attacked him. After this he redoubled his efforts to understand how to control beasts and seems to have developed a rapport with his beasts, shown in his ability Protective Battlegroup. PB allows Zaadesh to shunt any ranged or magical attack that hits him to a model in his battlegroup within two inches, once per round. The chosen model can't be knocked down or stationary. This happens on hit, so you have to do it before your opponent rolls damage on the attack. It's somewhere between Sucker! and Shield Guard. Combine that with his ability to transfer damage to his battlegroup, and keeping him near his beasts can help keep him alive. Zaadesh is all about making his beasts do more together than they can do separately. Perdition is a two cost spell that allows one of his beasts to make a full advance toward the nearest enemy model if it damages it's target. With hand cannon stats and FURY 4, it's going to need a boost to hit unless you have a knocked down target nearby. That will eat most of his stack, so I would say only do it in emergencies. His other spell, an upkeep called Tag Team, is the main reason to take him. Tag Team gives a +2 buff to both attack and damage rolls to models in his battlegroup attacking something that are engaged by another model in his battlegroup. Since he's part of his battlegroup, that can either buff him as a follow-up to Mat 8 P+S 14 or make his beasts rather intimidating. It just means getting a medium defense/arm model with few boxes in the front lines, no biggie. There are two ways I can see going with Zaadesh: either you maximize on your probability to hit or survivability. The key beast to run with him, given his excellent ability to die is the Cyclops Brute. The brute's Shield Guard ability can allow him to take two hits for Zaadesh before Zaadesh has to start taking them and transferring damage to his battlegroup. The high armor of a brute means those shots are much more likely to bounce off him than his controller. Either a second brute or Tiberon would maximize Zaadesh's survivability against shooting as both have SG and he can use PB to shunt a third shot to them before having to use his fury to transfer. The fact that they all have reach is a great bonus as it helps your spacing when you get in the mix. If you are worried about the brute's damage output, don't forget that if Zaadesh dives in first, an enraged brute is an effective MAT 7 and P+S 16, the same MAT and one point of damage less than a bronzeback's base stats. So yeah, this boy can hit. So far I've been running him with a mixed survivability package of a Cyclops Brute and a Shaman in my pMorghoul list. The Safeguard animus is invaluable to Morghoul and the shaman's ability to cast the animus of another beast is invaluable for a fury-starved caster. Additionally, the fact that Zaadesh and not your main caster can eat the fury off the cyclopses makes live so much easier. Now if you want to maximize your chance to hit, we need to look at the smallest beasts in the arsenal: the Scarabs and Reptile Hounds. Scarabs act as a pack and will get a +1 cumulative buff to hit and damage if they're in melee with something another scarab in their pack or an Aradus is in melee with. This means a full pack of scarabs in melee with something they're swinging four attacks at effective MAT 10 and P+S 13. Admittedly not that great, but if you need to take down something with a high defense, they'll chew through it's (probably light) armor. Reptile hounds, likewise start at decent MAT and sad P+S, but get their own boosts going to MAT 9 and P+S 10 with an additional die on damage. If getting into melee isn't quite your thing, you could also run him in a ranged list controlling your Cyclops Raider. The raider's animus is pretty much a necessity for any skorne ranged list, adding four inches of range to our guns for two fury. The ability to stay in the backfield and shunt off one hit to the raider makes me more comfortable with his role being to cast Far Strike twice and camp nothing. On the whole, I think Zaadesh is a good addition to a list that wants to run beast heavy, but only has a five or six fury pool on its caster. He can make our lights hit respectably and make your day much easier as far as fury management goes. He's vulnerable enough that you might need to bring a battlegroup based around keeping him alive, but he can make support beasts hit hard if you are willing to take risks with him. A fairly well balanced model that feels appropriate for its backstory and useful in a variety of roles.